Hi friends! 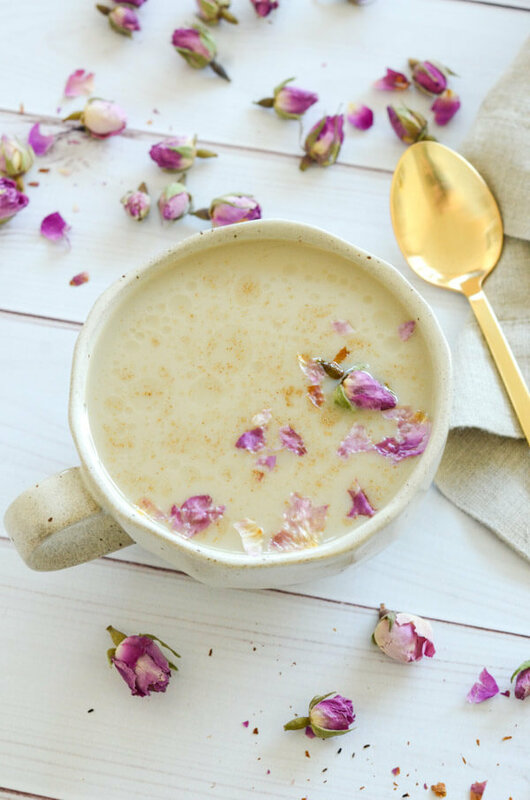 This recipe goes out to my fellow stressed out peeps looking for natural relaxation and anti-inflammatory solutions by way of delicious recipes. 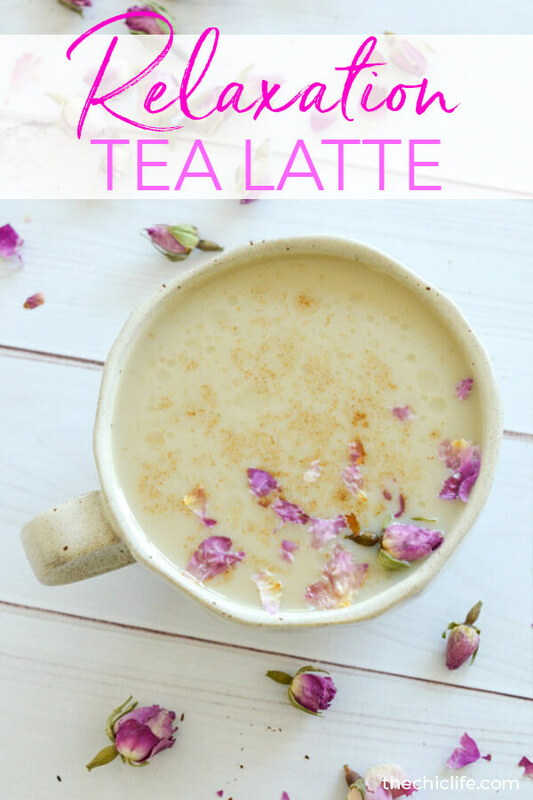 Today I’m sharing a naturally relaxing drink – this Tulsi Tea CBD Latte Recipe. Does this sound complicated? Don’t worry! Because this is super easy and can be whipped up in a few short minutes. Note #1: As you guys know, I’m not an RD or nutritionist. But even if I was, it’s important to speak to your personal health care provider(s) to ensure trying new foods or potential health solutions will be safe and beneficial for you before trying them out. Note #2: This post contains affiliate links. If you make a purchase from one of these links, I may make a small commission at no extra charge to you. Please do reach out if you have any questions. So as you can see, the ingredient list is nice and short. I do try to keep my recipes simple for you guys. Also, you know I like to make clean eating recipes to keep things healthy and close to the source. 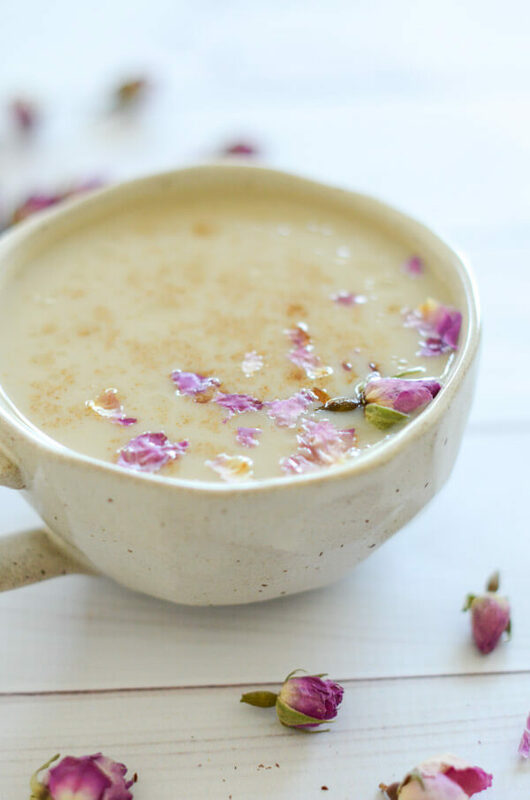 For this Tulsi Tea CBD Latte recipe, I went with as simple a preparation as possible. This only takes me about 6 or 7 minutes to (literally) whip up! 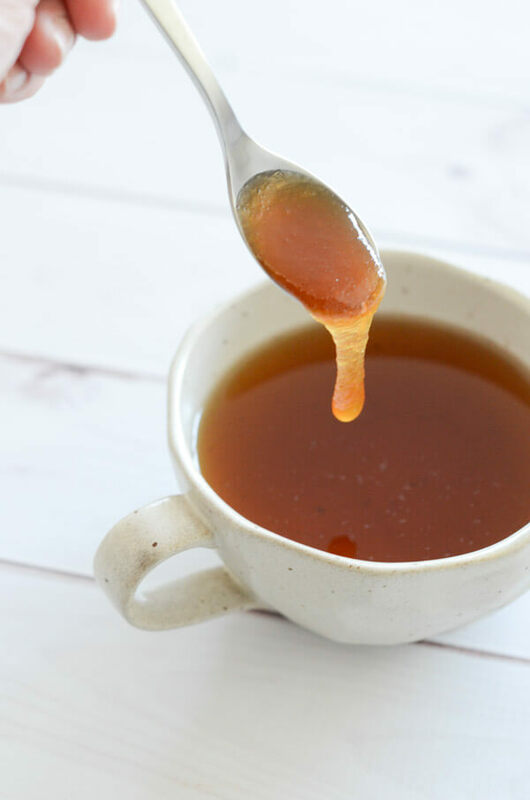 One thing I’ve been moving towards more strongly recently is avoiding refined sugars because they’re more processed than other sweetener options. 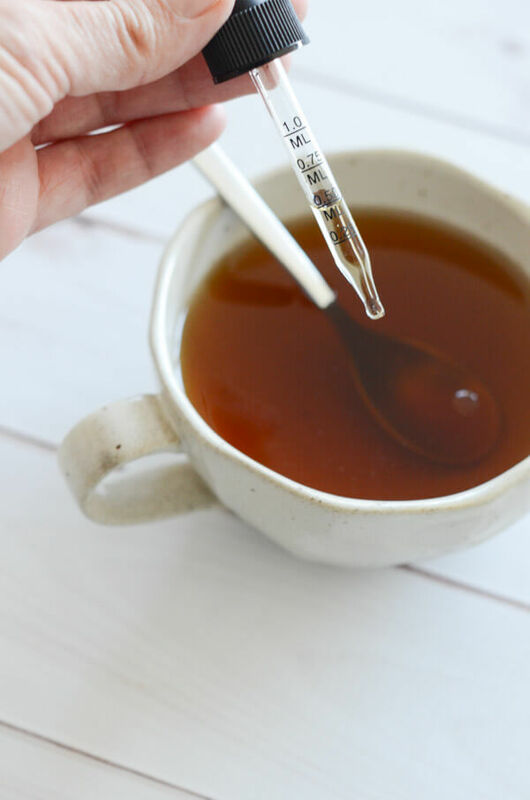 For that reason, I’m only suggesting honey and maple syrup as sweeteners for this CBD drink recipe. So what’s up with CBD? You may have noticed “CBD” popping up in conversations you hear, things you’re reading, and places you visit. One of the first places I found CBD oil was at my local yoga studio in NYC. 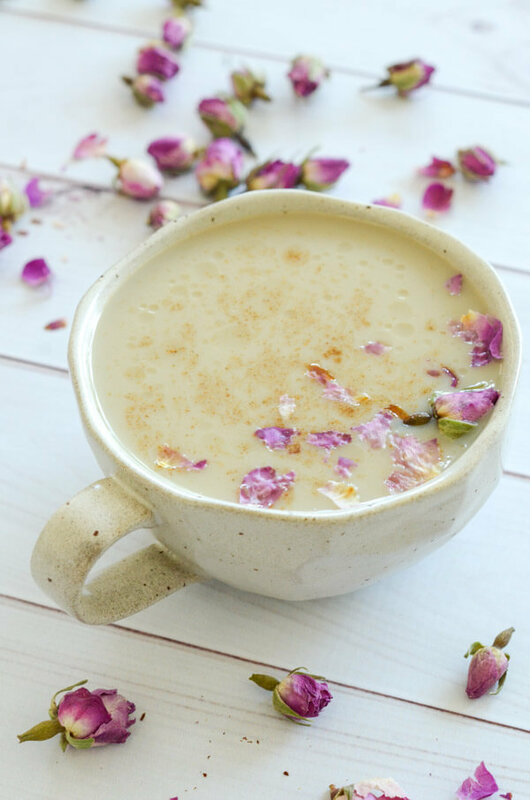 At the time, I was desperate for all things anti-inflammatory as I looked for natural ways to speed up the healing process for my back injury so that I could get back to dance classes and yoga. Furthermore, when I learned that CBD oil can also help with sleep, I was sold. When getting CBD, you want to make sure that the company is sourcing high quality ingredients. Medterra’s CBD is also non-GMO and THC free. Which Type of CBD to Use? There are surprisingly many options when it comes to CBD. For this recipe, I used this 3000mg CBD Tincture. 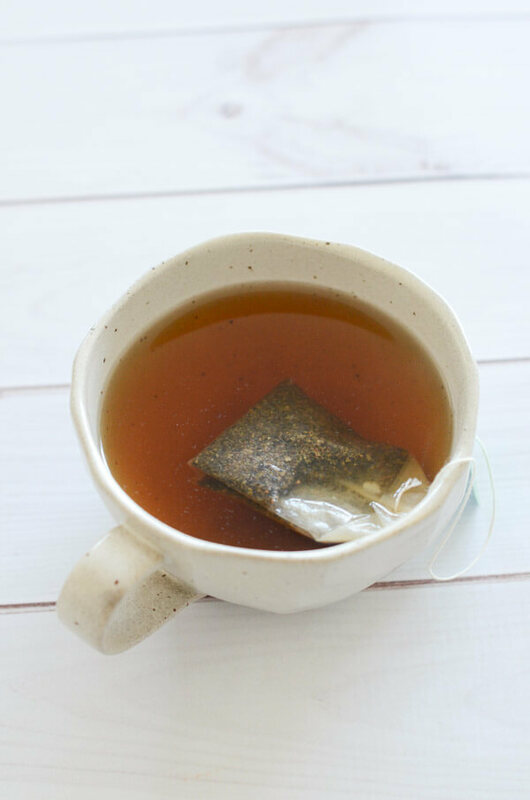 Ever since discovering it at a health food store, I’ve been drinking tulsi tea to help me with everyday de-stressing. Tulsi is a holy basil plant that I recently learned is also an adaptogen. And adaptogens help our bodies adapt to stress. For my everyday tulsi drinking, I usually just stick with the normal brewing sans sweetener. But this latte is a little something special. 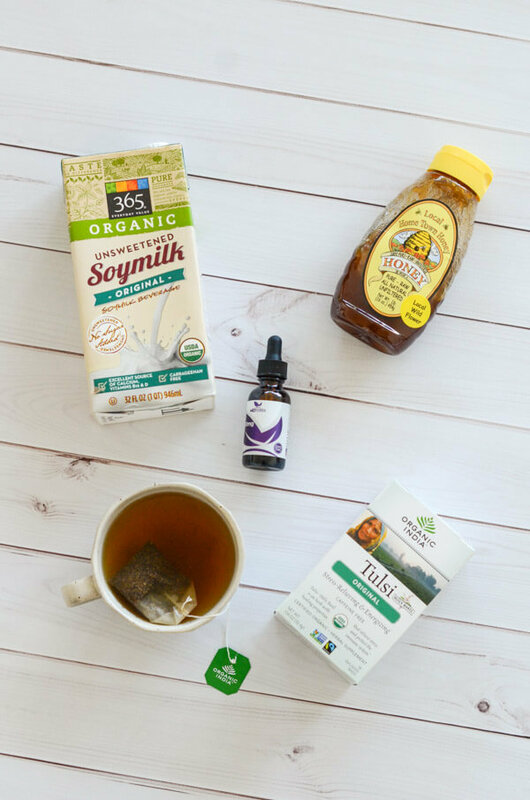 So now you have two powerhouses in one drink: CBD + Tulsi tea. Woop! And aren’t the roses on top just so beautiful!? Even if you’re not entertaining, I definitely recommend adding some edible flowers on top. Because – treat yo self! These culinary-grade edible roses are by Rose Dose, and I got them on Amazon. They make this drink soooo pretty! Thank you so much for stopping by! 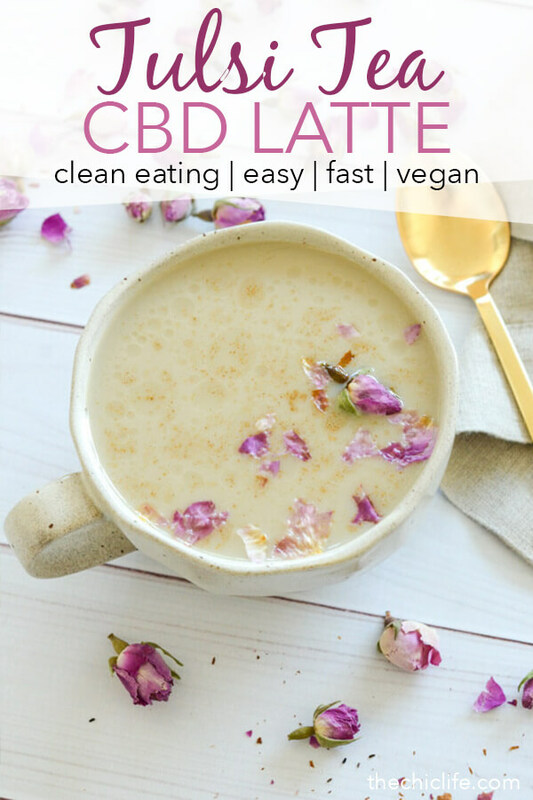 Hope you enjoy this clean eating Tulsi Tea CBD Latte Recipe. 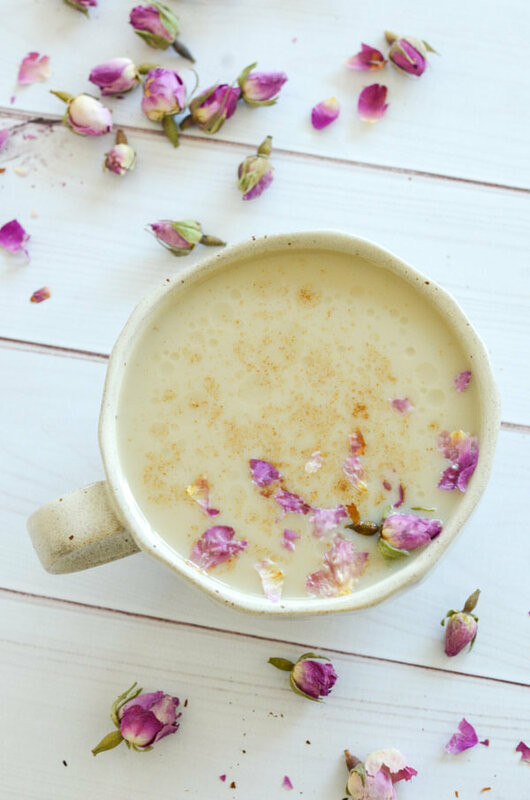 Please let me know how you like this naturally relaxing drink in the comments. And I’d be honored if you’d share this recipe with your friends using the share buttons on this post. Cheers! I love this recipe !! 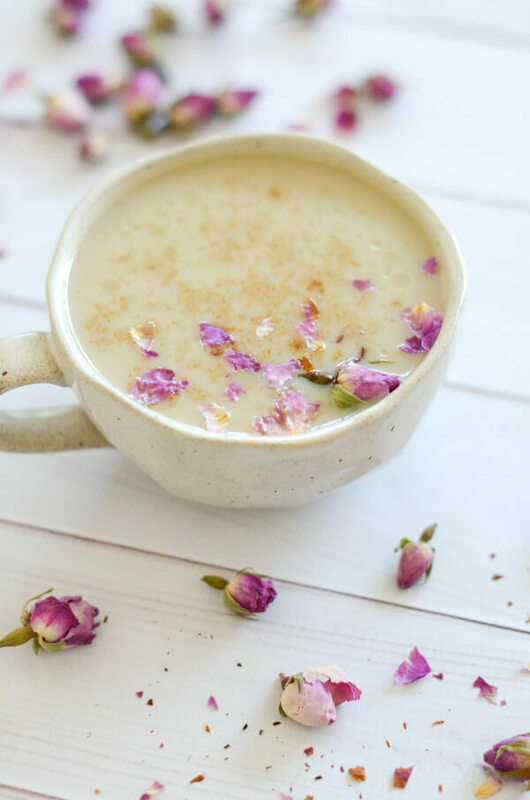 You have gorgeous photos and are using CBD in your drink which I think is totally awesome!